We were asked if we wouldn’t mind putting together a little more of an in-depth insight into how best to deal with social media for the property industry for a future event. Helping the property industry adapt online is why we’re in this business in the first place so we were only too happy to oblige. Earlier this month, we made our way to the Bristol regional conference along with a great range of other property providers and industry experts. Alongside us we had the likes of Fixflo, NFoPP, HM Land Registry and a handful of amazing motivational speakers, it was a genuine pleasure to be part of such a high profile event. 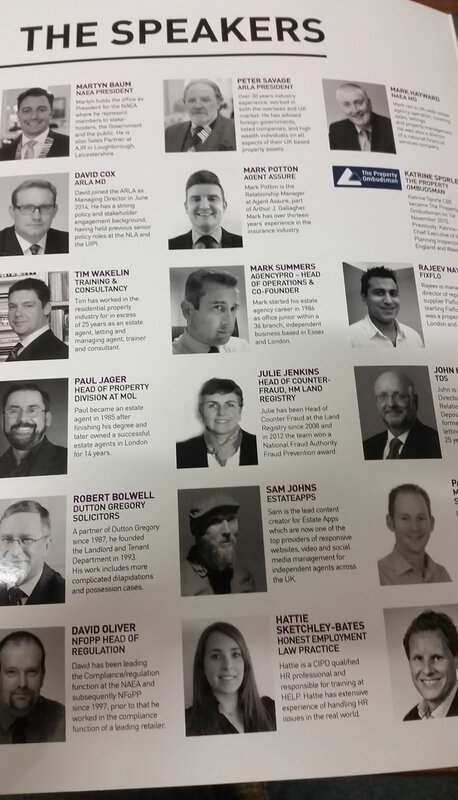 I even got my picture in the programme! "After seeing Estate Apps present at another event, we instantly knew their company was something we wanted to be part of. We offered Estate Apps to speak at our most recent NAEA ARLA Bristol conference and with great delight they accepted. The feedback we received from delegates who attended the event was excellent after Sam’s presentation. Following the success of this, we aim to work very close with such a well put together organisation." As if that wasn’t an amazing opportunity within itself, things went so well we received an invite back the following week! One of the local NAEA masterclasses was missing a speaker so we were kindly asked to stand in. We couldn’t have asked for more from our visit to the NAEA, it’s great being able to share the knowledge we have and for agents who are genuinely interested in delivering better engagement with their local area (and beyond!). We hope to be at another event soon so, if you see us, be sure to say hello!